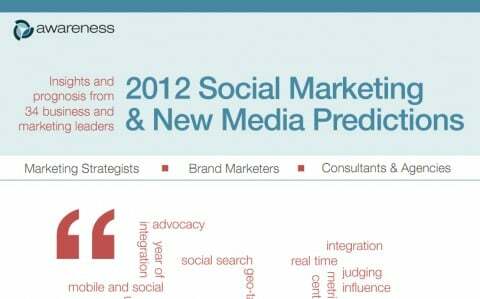 The team at Awareness (who offer social media management software I like a lot), recently published a terrific, free ebook of 2012 social media predictions. …and 20+ other folks I’m hoping to get to know. We’ve been nibbling around it for a while, but 2012 will be the year of the multi-media social network. Photo and video-based social interaction weeds out the banal, as the process of taking/uploading multi-media forces you to self-edit. That delay of just a few seconds allows the question “Does anyone REALLY care about this?” time to be considered. Consequently, there is more meat on Instagram and Viddy and Tout than there is bun, and that enables the whole point of social networking – making and perpetuating connections and seeing the world through someone else’s eyes – to flower. Big data is going to usher in an even more important corollary industry – big interpretation. Our problem in social media isn’t lack of data; it’s lack of understanding how to make that data actionable. Most big data projects and companies are only answering half the question, at best. As much as we predict that every year is the ‘year of mobile,’ it seems like we’re finally getting somewhere, We’ll see a concerted effort by companies to make their content mobile-friendly, and I’m bullish on what near field communication (NFC) can provide in the realm of instant information retrieval and mobile commerce. The big question for companies that have not yet fully created social media centers of excellence, etc. (and most haven’t)? Resources. Who in the company is supposed to be handling this stuff? How many people do you need? How are they trained? Where do they come from? 2012 is the year of social media labor questions. Which of these is most likely to be NOT true?